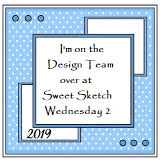 It's time for another new sketch over at Sweet Sketch Wednesday 2 and this week we are sponsored by the fabulous DigiStamp Boutique. I think that it would look great rotated so the flowers are in the left hand corner as well but I kept it as it was for my card as it suited the image I had chosen. I used the image Alyssa relaxing and the sentiment came with it. I coloured it with Copics and my papers are American Crafts My Girl. The oval dies are spellbinders and the flowers are cut from Joycrafts dies. The lovely (well I think it is) scroll shape card is from Craftwork Cards. 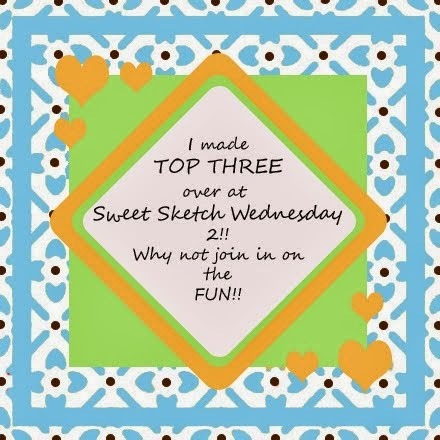 Thank you for visiting and do play along with us if you can. Hi Anne, I just love your card it's so pretty and I love your flower embellishments. Yes your right this sketch would look good rotated either to the left or right. I do love this card base you've used from Craftwork Cards it really pretty. Take care and have a great week. Anne - your card is so beautiful!! 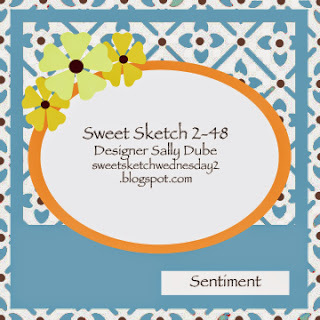 Love the papers you chose and your coloring... the flowers are the perfect addition. Makes me want to soak in a hot tub right now (think they would mind if I left work...?). What a pretty card this week Anne. I love those soft colors and Alyssa in the tub is such a cute image! I agree with Sally, a good soak sounds amazing right now! Gorgeous card Anne!! So relaxing! Love your papers and fun image. I received this Pamper Yourself card for my birthday and the picture shows it at its fabulous best! Great colours, nice image & I loved the shaped edge. I love this image and have an idea who's card it would work perfectly on!! The colours are perfect very trendy!